Residents of the small town of Dugger, Indiana are fighting to keep a cross that was erected alongside a major roadway from being relocated following threats from a national legal organization that seeks to separate church and state. 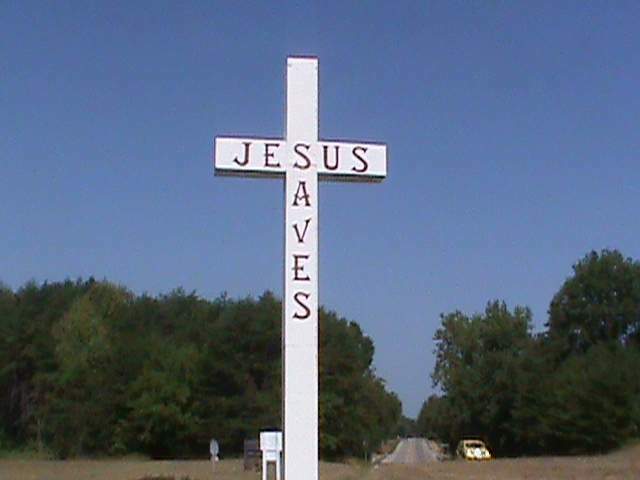 The 26-foot cross, which is inscribed with the words “Jesus saves,” was placed next to a high school baseball field two years ago by Faith Community Church with the approval of town council. However, following a complaint, the Washington-based group Americans United for Separation of Church and State recently sent a letter to the town advising that the cross had to be moved as it purportedly violated the Constitution, since it occupied public land. “Because the Establishment Clause of the First Amendment to the U.S. Constitution prohibits the government from promoting religion on public land or financing efforts to do the same, we request that the Town promptly transfer the cross to a private entity for display on private property and cancel any plans to provide electricity or other financial support to the display or maintenance of the cross,” the letter stated. Locals were not pleased with the organization’s demands. “There were some great men … [who] decided that they were going to let their light shine and show their faith to a community who desperately needs it,” explained one resident who is supportive of the display. Ferris and his congregation have been gathering around the cross to pray for it to remain somehow. He says that he has received many positive comments from Christians that have learned about the situation. Upon consideration of the letter from the legal organization, town officials had leaned toward relocating the cross — not because they didn’t want it to stay — but because they believed the municipality could not afford to fight the matter in a lawsuit. Americans United for Separation of Church and State had threatened to sue Dugger officials if they did not move the cross elsewhere, and demanded a response within 30 days. However, the town has now changed its mind. Officials have agreed to sell the plot of land, which is less than half an acre in size, to area churches who wish to keep the cross alongside the road as a message of hope to passersby. Reports state that the town may be able to get a free appraisal of the value of the land since it is unable to spend any money in relation to the sale. It is possible that Christians in the community will band together to help pay for the property. Americans United for Separation of Church and State is headed by Barry Lynn, who is an attorney and licensed “minister” in the United Church of Christ. The organization has been challenging public displays of Christian and religious symbols since 1992.